Home HDG Srila Bhakti Dayita Madhava Gosvami Maharaj Have I Made a Mistake? A doubt occasionally arises in my heart. I think, Have I made a mistake in accepting the shelter of the lotus feet of the Gaudiya Vaishnavas? It certainly seems so. I appear to have made a mistake in taking up bhajana, in accepting the shelter of the Gaudiya Vaishnavas and, specifically, in taking refuge of the Gaudiya Matha and dedicating all my senses to serving in the Matha. Gaudiya Vaishnavas are not big-hearted. When we perform bhajana under their shelter, we are controlled by so many rules and regulations. If I were to take refuge of some other sampradaya where there is no concern for offences, such asvaishnava-aparadha, nama-aparadha or dhama-aparadha, I would feel no such hindrance or botheration. I would not be obliged to develop exclusive devotion for a particular object of worship [such as Radha and Krishna], nor would my eating habits be curtailed. In the Matha, issues like vaishnava-aparadha are raised, and it often impedes my unrestricted sense enjoyment, lawless gossiping and other whimsical activities. It would therefore be better for me to live outside the Matha than be governed by such restraints. Sometimes I even think it would be best for me to abandon the shelter of a gurudeva as controlling as mine altogether, and to accept the mantra elsewhere, from someone who doesn’t demand that I pay attention to all the rules and regulations. Thus, I occasionally contemplate severing my ties with the Gaudiya Matha completely. What stops me, however, is the thought that if people were to find out that I had broken my connection with Sri Guru, it could jeopardise my prestige and position. 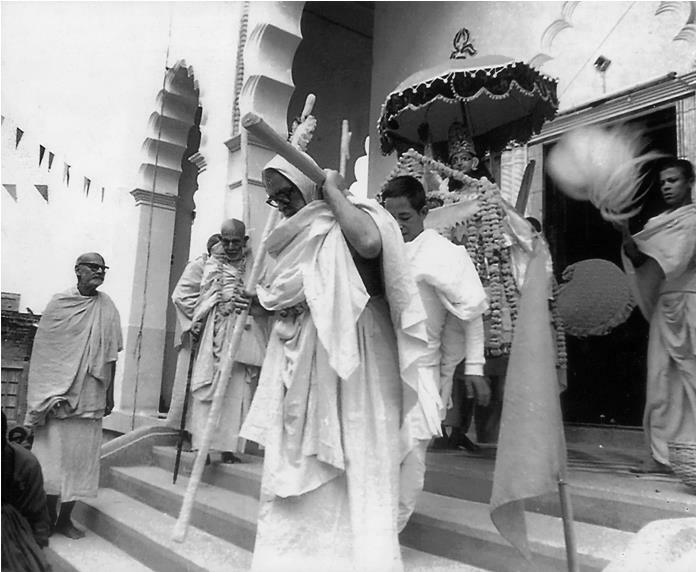 The Vaishnavas of the Gaudiya Matha are one-pointedly engaged in worshiping Sri Gaurangadeva and Sri Radha-Krishna, under the guidance of Sri Rupa Gosvamipada and the best among his followers, namely, Srila Bhaktivinoda Thakura and Srila Bhaktisiddhanta Sarasvati Gosvami. Krishna-prema is their only goal and their only practice, or sadhana. There is no absence of affection or devotion in the sadhana of the servants of the Gaudiya Matha. Hence, they will never support any endeavour that is unfavourable to the cultivation of affection for Sri Krishna. What auspiciousness can a sadhana bring if it can’t offer its practitioner any way to attain his cherished goal quickly, or if it can’t even offer him any certainty that he will realise his worshipable deity at all? This type of sadhana, when propagated, tends only to attract followers. For those content to pass their lives without purpose or restriction, what use is there to accept the lotus feet of sad-guru, a transcendental teacher? But those who can see their own faults and anarthas, and who try to become free of them, develop an urge to become qualified to taste the bliss of prema for Bhagavan. Only they can remain in the shelter of saintly devotees endowed with this prema. They can experience the happiness of being engaged in service to Bhagavan by living under the guidance of such one-pointed devotees and following their instructions. This involves subduing their senses and abstaining from whimsical activities. Those who make a show of accepting the shelter of the lotus feet of Sri Guru simply deceive themselves; they pretend to be self-controlled and reformed but internally maintain their previous bad impressions, and especially the tendency to strive to gather followers. In other words, they recruit followers on the pretext of accepting the shelter of Sri Guru, with the aim of fulfilling their selfish ends through their so-called disciples. The attempts of such arrogant and duplicitous people to attain auspiciousness are endlessly frustrated. To be a disciple means to be disciplined, or controlled. If a person outwardly accepts the shelter of Sri Guru but arrogantly maintains the attitude that he knows best about his spiritual life, then he is but a cheater , deceiving both himself and others. Pure Gaudiya Vaishnavas are most magnanimous and bestow the highest auspiciousness. If we can become eligible to understand even a single aspect of their exemplary lives we will become attached to sadhana bhajana and be filled with jubilation and devotion. Those who possess krishna-prema are neither enjoyers nor renunciants. They are not karmis, fruitive workers; neither are they jnanis, persons cultivating knowledge of the impersonal Brahman. Those who perform activities opposed to scriptural injunctions honour karmis who abide by scriptural injunctions; and when karmis who are eager to enjoy the results of their endeavours see the external renunciation of jnanis and renunciants, they may be attracted to them. However, those who hanker for bhagavat-prema disregard both of these paths. They are attracted only by behaviour that nurtures the cultivation of this prema. One must deliberate upon this verse. The activities of a devotee of Krishna, such as establishing a matha (spiritual institution), constructing a temple, meeting with materialistic or aristocratic people, hosting festivals with pomp and grandeur, and giving instructions to ignorant or faithless people, are all suddha-bhakti. To serve Bhagavan and the devotees one may supervise the construction of a temple or the house of a devotee, collect materials, purchase supplies and accept the lowly propensity to beg. Such activities are supremely pleasurable and they nourish one’s bhakti. We should consider this account in the light of our discussion. That chaste brahmana wife’s service to a lowly prostitute in the sincere endeavour to please her husband enhanced her glory. She thus became worshipable for the entire world. What’s more, she became very dear to Sri Bhagavan. If, however, she had performed this service for her own sense, pleasure, or for dharma, artha, kama or moksha, it would have been reprehensible in every respect. Similarly, activities such as constructing a matha, meeting and talking with materialistic or aristocratic people, hosting grand festivals and bestowing the sri nama-mantra to faithful persons sincerely desiring to serve Sri Bhagavan, His devotees and His dhama (all aspects of Vaikuntha), enhance Bhakti and ultimately cause prema to appear. Those same activities, however, bind one to this material world if they are performed with the aim of gratifying one’s senses; accumulating wealth, women and fame; or attaining dharma, artha, kama or moksha. In this world, renunciation means to relinquish the objects of one’s attachment. But can ceasing to take foods that merely aggravate a disease, for instance, be considered renunciation? Abstaining from foodstuffs that destroy good health and instead accepting foods that increase longevity can hardly be celebrated as a great act of renunciation. Thus, it is hard to see how the act of renouncing one’s father, mother, relatives, friends, wealth, occupation, business or worldly duties performed to gain material comforts, can in itself be glorious. Only when a person renounces the objects of his mundane pleasure for the pleasure of the Complete Entity [Sri Bhagavan], expecting no sense enjoyment in return, can his renunciation be considered actual renunciation. In other words, true renunciation entails not striving for dharma, artha, kama or moksha, or for wealth, women and adoration. Ordinarily, it is considered irreligious to forsake the duties the scriptures prescribe for one’s varna and asrama; but if these duties are discarded for the pleasure and satisfaction of Sri Krishna, who is the cause of all causes and the bestower of supreme bliss, then and only then is such renunciation honourable. Indeed, such renunciation, which benefits everyone, is to be revered. To renounce endeavours for sense gratification, that is, endeavours in one’s search for happiness in this world or in the next is courageous and glorious. But the topmost renunciation is to abandon everything, even one’s independent will and desires, for the pleasure of Bhagavan Sri Krishna and His one-pointed devotees. Renouncing the mind’s propensity for independence, in other words, the sacrifice of one’s very self, is far superior to renouncing that which is inert and temporary. The glory of one’s renunciation lies truly in the glory of the object of such sacrifice. Sri Bhagavan and His devotees who possess prema are unlimitedly glorious; and therefore to renounce for their pleasure is supremely noble. Such renunciation is incomparable because it increases the happiness of all living entities by reawakening their relationship with Sri Bhagavan. It does not admit even the slightest scent of distress. Rather, the renunciant feels increasingly happy at every step. It can therefore be concluded that such renunciation bestows bliss in every respect and is highly esteemed. Fruitive workers, or karmis, make sacrifices and perform austerity with the hope of attaining increased mundane sense pleasure in the future. Such renunciation is therefore meagre and does not bestow complete happiness. Jnanis, who aspire for impersonal Brahman realisation, make sacrifices and perform austerity to dispel their own suffering. Their renunciation, also, does not bestow full happiness. The sacrifices and austerities of Krishna’s devotees, however, are meant exclusively for the pleasure of Sri Hari. Since Sri Krishna is the cause of all causes, such renunciation bestows true welfare upon the devotee and upon others. Therefore Gaudiya Vaishnavas greatly honour those activities that promote love of Bhagavan, and they reject activities that hinder it. In this sadhana any sense enjoyment and renunciation that is favourable to bhakti is highly regarded. Yet devotees are not attracted to sense enjoyment and renunciation in their own right. They are attracted to love for Bhagavan and His devotees. They have no independent or whimsical desire to enjoy or renounce. Yukta-vairagya, renunciation for the pleasure of Sri Krishna, is their only sadhana. Without understanding bhajana-rahasya, the secrets of bhajana, one will become bewildered by what sense enjoyment is and what renunciation is. Both are impediments in the sadhaka’s cultivation of prema for Bhagavan. Those who have realised that this human life offers an invaluable opportunity to work towards attaining the supreme goal, prize every moment of it. They are unwilling to waste even an instant in any other endeavour. They know that living entities in other species of life do not have the facility or good fortune to make progress towards the supreme goal and, accordingly, they see no value in living their lives in the manner of the lower species. Hence, upon attaining this extremely rare human life and, on top of that, attaining the fortune to associate with sadhus and developing sraddha for the supreme goal, they cannot quietly squander a single moment of their lives. Rather, they will accept only what is favourable to the cultivation of affection for Sri Krishna and will reject all activities that are unfavourable to it. As such, the devotees of the Gaudiya Matha instruct the world to engage only in those practices that are righteous and favourable to the cultivation of krishna-prema and to reject unrighteous activities that impede it. Moreover, they never indulge in violence or envy, as this hinders the cultivation of prema. Thus, if I am genuinely searching for krishna-prema, I have not after all made any mistake in accepting the shelter of the lotus feet of pure Gaudiya Vaishnavas. Such Vaishnavas will not fuel our desire for dharma, artha, kama and moksha or our hankering for wealth, women and adoration. The purpose of the Matha is to help free us from these anarthas and attainkrishna-prema. By taking shelter of the lotus feet of pure Gaudiya Vaishnavas in the Gaudiya Matha, beggars for krishna-prema become qualified to attain their greatest welfare. Moreover, they receive the opportunity to achieve the highest ideal of magnanimity and to ascend to the topmost level of pure vairagya, renunciation. This is my unshakable conviction. One cannot be deviated from attaining prema for Bhagavan in due course, unless one becomes a severe offender. One day, by the mercy of Srila Prabhupada, the world will profusely glorify and worship the Sri Sarasvata Gaudiya Vaishnavas [that is, Srila Prabhupada’s followers]. They alone are able to establish the highest ideal of benevolence in the world. Victory will certainly belong to the devotees of the Gaudiya Matha, or those who have taken shelter of the lotus feet of Gaudiya Vaishnavas. I have not, therefore, made a mistake in accepting the shelter of the lotus feet of pure Gaudiya Vaishnavas. Rather, I have whole-heartedly embraced the good fortune of attaining my highest welfare, and thus I am truly blessed.